Are you thinking about creating an online store? 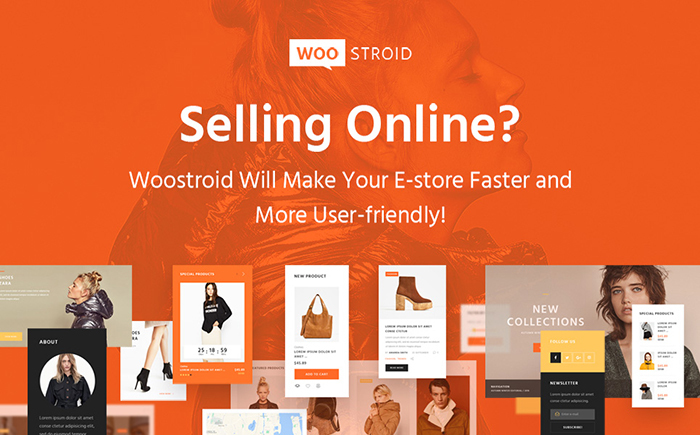 Then, these 25 awesome WooCommerce themes will definitely strike your eye and show you numerous features that a modern online store can have. 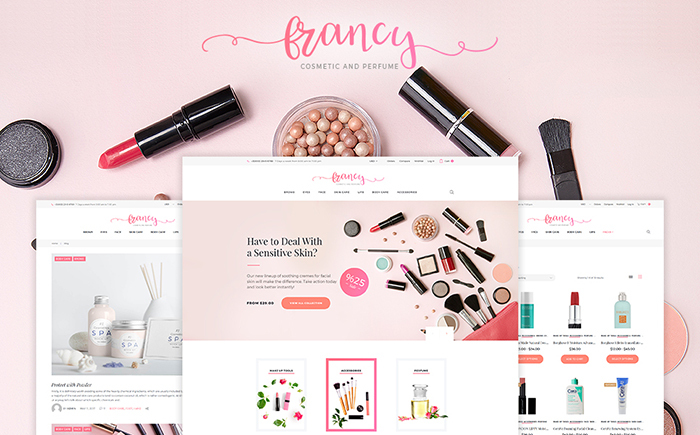 It is hard to imagine, but, frankly speaking, you do not need to create a unique webpage out of nothing if you wish to run an online store. There are numerous ready-made templates, such as the ones created by TemplateMonster, that can suit your needs. Whether you want your store to be connected with fashion and beauty, or whether you want to sell medical or sports equipment, you can find a template to suit your needs. Without any doubts, a custom webpage created especially for you will take into consideration your smallest requirements, so when you order a custom website you have a possibility to get everything that you imagine. At the same time, ready-made templates are developed by groups of professionals to suit specific needs, and you can have a look at the demo version of such templates, so you will definitely know what you are buying. While you will be waiting for a custom website to be created for you, you can spend this time for looking through different templates that can suit your needs and comparing their properties to choose the one you like most. As the work of developers and designers for creating your custom website takes considerable time, it should be paid for accordingly. In such a case, ready-made templates will save not only your time, but also your money. Does choosing a ready-made template instead of ordering a custom webpage mean that you will not get a unique website? Of course, it doesn’t, because ready-made themes have numerous customization options. You can edit backgrounds and layouts, add or remove sidebars and widgets, change colors and fonts in order to adjust the theme to your needs and company’s style, creating unique looks of your website. Furthermore, as online shopping is done using different devices, ready-made templates by TemplateMonster are responsive. They easily adjust to different screens and browsing ensuring the best performance for your customers. No matter what device or browser your visitors are using, your online store will look and function properly. Another piece of good news is that ready-made templates don’t require much coding skills to be installed and launched, so you will be able to create your website in a couple of moments. If you happen to face any difficulties, there is always a 24/7 support team to answer your questions and solve your problems. 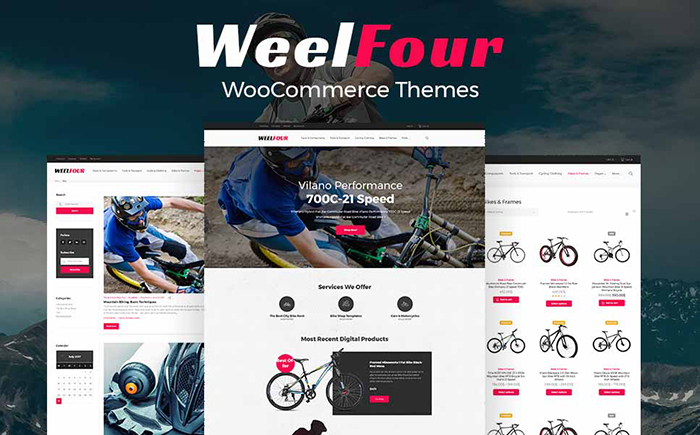 So, do not hesitate to look at the amazing collection of WooCommerce themes that will be suitable for various online stores. This feminine and stylish theme is, in fact, built with power Drag-and-Drop builder to ensure the best productivity and customization options. You can choose not only from numerous layout options, content modules and widgets, but also from effective Cherry Plugins, such as Cherry Team Members, Testimonials, Sidebars, and others. Your customers will also love Quick View plugin that displays the characteristics of a product and allows people to view the item in a full size. Moreover, there are Wishlist and Compare plugins to make the functionality of your store better. Supporting not only WooCommerce, but also Ecwid, the theme will be a universal solution for various online stores. The template can boast of numerous features to optimize your online store, such as Compare, Advanced Thumbnail Feature Hover, and Wishlist. Furthermore, it supports Megamenu and includes advanced headers management. You can be sure that your website will be optimized for mobile devices, as the theme is responsive and Retina ready, with a clear design for effective and intuitive using. 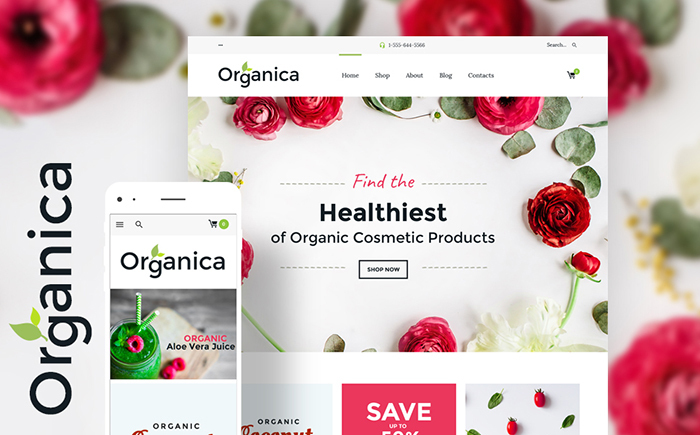 Equipped with an unlimited amount of features, this theme will be suitable for an online store that sells organic products, such as organic food, cosmetics, bio active nutrition and so on. Adding different product categories tabs, you will easily organize your products into logical and structured categories. Also, your customers will enjoy the possibility to sort goods within search results according to several criteria, to compare different products and to add them to their wishlist. Moreover, custom widgets will enrich your site’s functionality and help you with the ways to showcase your content. 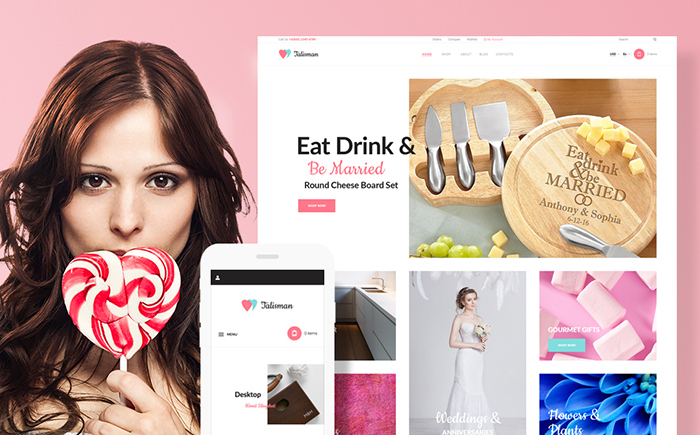 This contemporary-looking theme will impress you with the possibility to create a shop page with a Puzzle option; another practicable means of editing your store is using various blog styles, including standard, masonry or timeline blog layouts. You can easily create portfolios in different styles and add personal profiles of designers or partners to your website. In addition, you can maximize the theme’s functionality with powerful plugins and addons, managing the look of your headers, colors and page content. This theme will be appropriate for creating any kind of a store, as it is supplied with various widgets to make your business more effective. 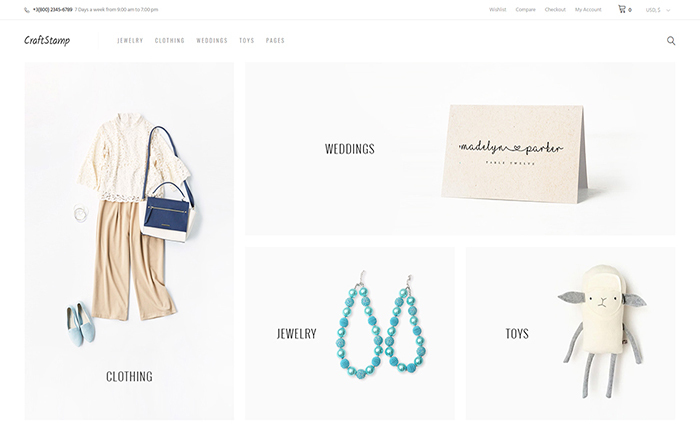 Present your goods in a variety of ways, adding posts carousels, sliders, or image grids to your page. Customize the look of your website changing layouts and fonts and adding various Cherry sidebars without any difficulties with Live Customizer. Built with Bootstrap, the theme guarantees full responsiveness and compatibility with all modern devices. 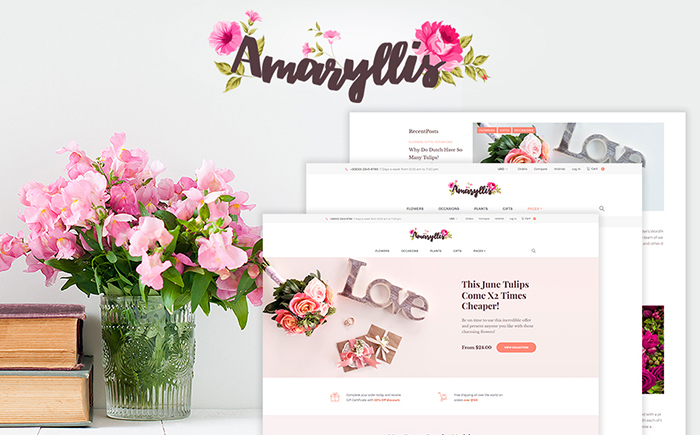 If you want to create a webpage for an online store that deals with handmade art, this template will be a perfect choice. Including different content modules and an enormous set of Cherry plugins, such as Cherry Projects, Team Members, testimonials, Sidebars and others, the theme advances your site’s functionality and allows you to present various types of information on your website. With advanced banner grid management, product carousel, categories widget and on-page custom menus you will easily arrange the content the way you find most appropriate. Moreover, your clients will be attracted by the WooCommerce Quick View that gives details about the product and by Wishlist and Compare plugins that will provide them with time for making up their minds. 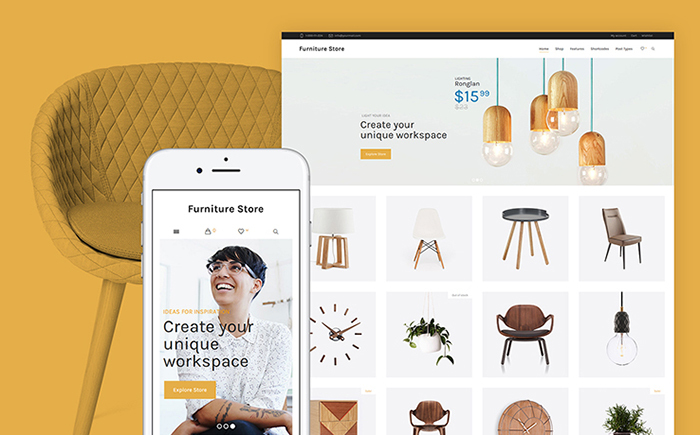 An awesome WooCommerce package included into this theme will let you present your products in a number of ways. In addition, due to Content Modules you will be able to add different types of posts to your webpage, including galleries, buttons, pricing tables, contact forms and many more. Customization of your website will be an enjoyable experience, because you can choose from multiple layout options and edit elements with powerful Drag-and-Drop builder. As a special bonus, you receive 15 topical images that will suit your website perfectly. 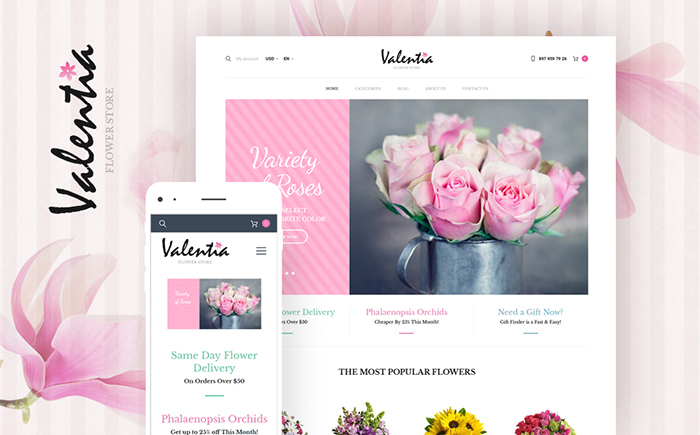 You will love this bright and elegant theme for an online flower store, because it includes categories tabs to make your website logically organized and structured. Moreover, your visitors will be able to use sorting options, which will facilitate the process of choosing goods. With various background and layout options you can experiment with the look of your website, making it even more personal with Google-integrated fonts. 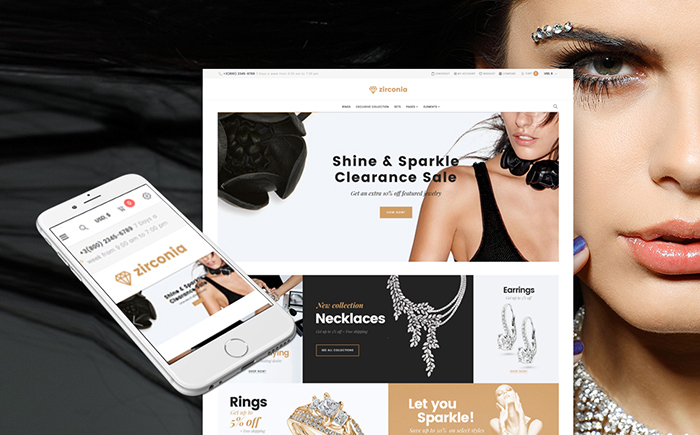 This theme, built with a powerful Drag-and-Drop builder, will help you create a productive store that sells jewelry and accessories. 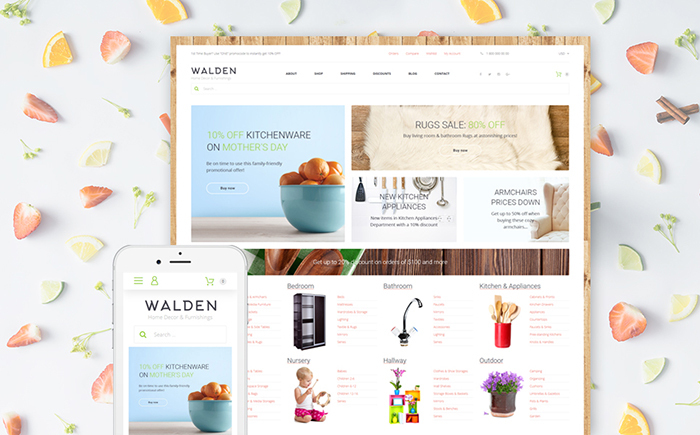 It includes not only an ultimate pack of the best Cherry Plugins, such as Cherry Sidebars, Testimonials, Team Members, Projects, and others, but also a WooCommerce package that gives additional ways to present your goods. Your customers will be enchanted by the possibility to have a quick view at the products, to compare and add them to the wishlist for making their final choice later. 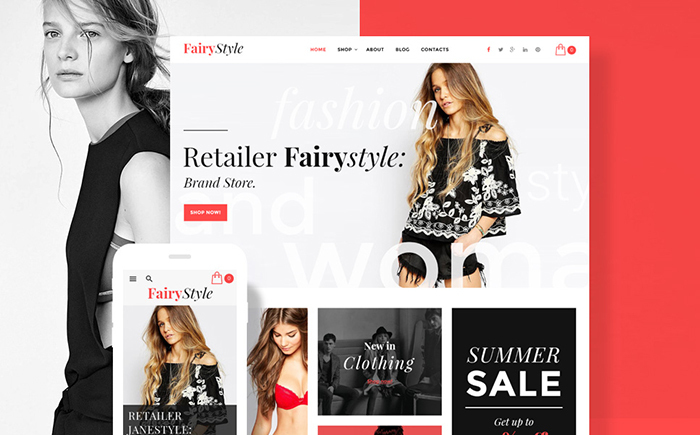 Featuring a lot of built-in functions and customization options, this theme can be used for creating an online store for different purposes. Cherry Sidebars will help you present your products effectively, while WooCommerce package will enhance your website’s functionality. In addition, the theme can boast of a dropdown menu to make your goods organized, as well and of a calendar, a commenting system, and other social options to keep the ongoing communication with your clients. 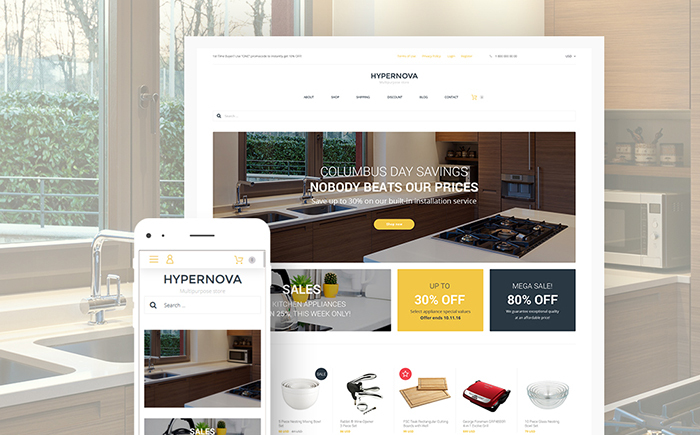 Optimized for online stores that deal with home décor and furnishing, this theme can be proud of such effective features as Ajax Shopping Cart, Compare, and Wishlist that make the process of online shopping a pleasant experience. Arrange numerous goods into a Dropdown menu to make your website organized and structured, captivate your visitors with different goods presented in a products carousel, and easily adjust the look of your website with Live Customizer to make a unique powerful online store. Choosing special gifts for various occasions can be quite a challenging task, so a powerful online store that deals with gifts will be helpful for customers, and this theme has got everything in order to become such a store. Your visitors will love the possibility to sort out the products according to different criteria instead of having to scroll through all product lists. To attract people’s attention, you can use carousel widget and showcase your goods, product categories, latest arrivals, products on sale or any other necessary news. With various social options that include Facebook Like Box and Instagram Board your clients will be able to share information about their dream gifts, thus promoting your store online. 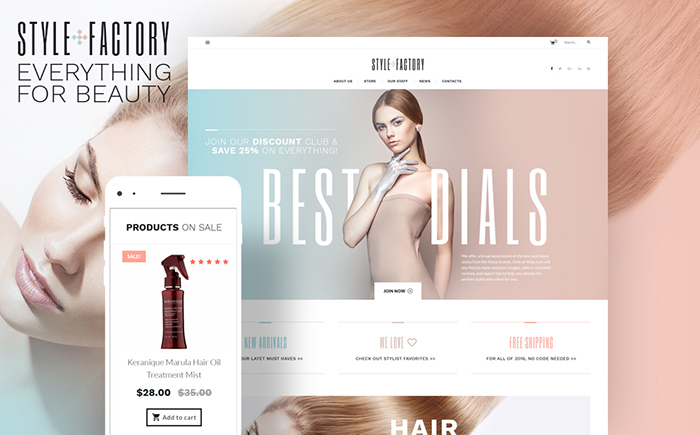 This magnificent theme with numerous layout options will be suitable both for an online store that deals with hair care and for a salon devoted to hair styling. Your online store will be equipped with such powerful options as wishlist and compare, which give your clients some time for thinking before making their final choice. As for a salon, a striking Appointment Manager and Timetable plugin will become useful both for clients who want to make an appointment directly on your website and for you as a manager, as you will be able to organize your schedule easily. 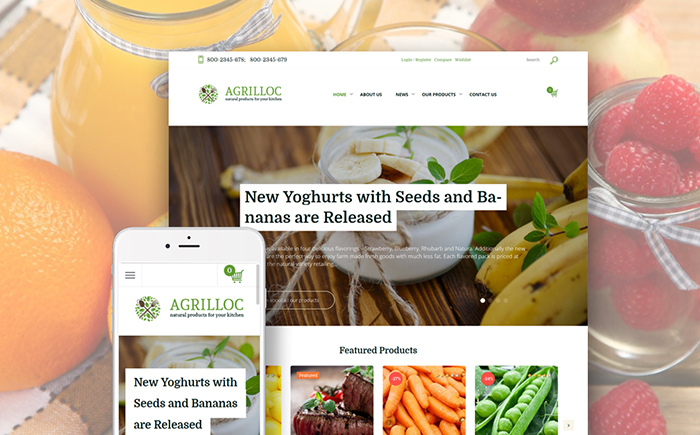 Light and undemanding, this theme will be ideal for an online store that deals with agriculture products and natural farm foods. With Dropdown menu, a large assortment of goods will be arranged logically into different categories, and Wishlist and Compare options will facilitate the process of searching and making a choice. Social options embedded into the template will help your customers share information about your goods, and they will sell like hot cakes. 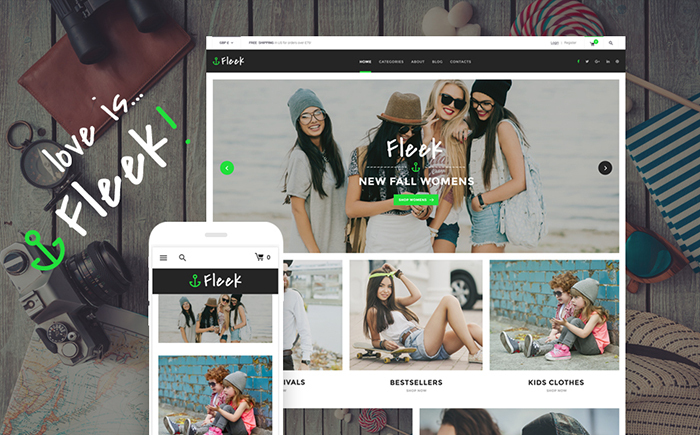 An online brand store that deals with fashion definitely needs a stylish website to attract visitors, and this theme will be perfectly satisfactory for this purpose. Its design will let you showcase products in an unlimited number of ways, among which you will be enchanted by a carousel widget, and sort your goods into categories adding special tabs to them. Advanced theme options, integrated Google fonts, and Live Customizer will turn the process of adjusting your website to your needs into a delightful experience. As fashion has to be spread quickly, the theme features numerous social options, including a contact form, a newsletter subscription, Facebook Like Box, Instagram Board, and Twitter Feed. 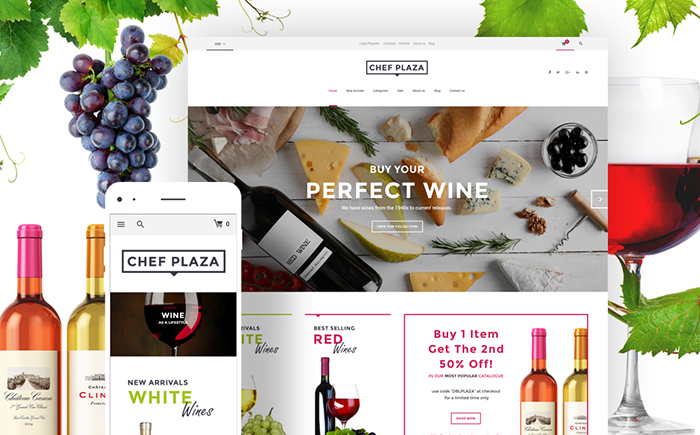 Easy and intuitive with user-friendly interface, this theme will be especially convenient for creating an online store that sells food and wine. 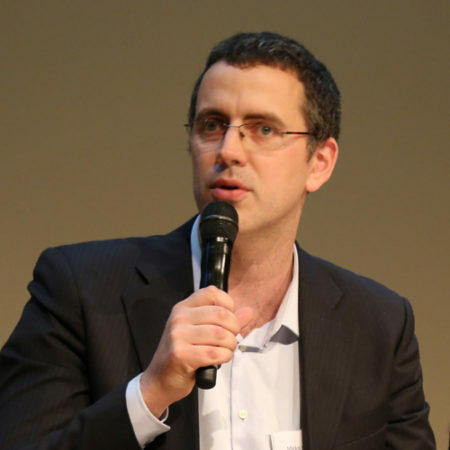 To facilitate the search process for clients, the theme includes sorting options that allow people to limit their search results by several criteria. You can be sure that your goods can be arranged into numerous logical categories with the help of product categories tabs. Moreover, various custom widgets, including Simple Slider, post carousel, and social media widgets, will advance your site’s functionality. Being fashionable means finding out about new tendencies and new collections quickly, so a good fashion store should present this information in an appropriate way to attract visitors, which is indeed quite easy with this theme. Due to numerous widgets and sliders you can showcase your latest collections, new arrivals, the most popular products, goods on sale, or whatever you want to tell your clients about. The process of finding necessary items will be easy for customers because of the product sorting options that allow them to choose several criteria to limit search results. Newsletter subscription and different social options will let your clients follow your news and stay updated all the time. 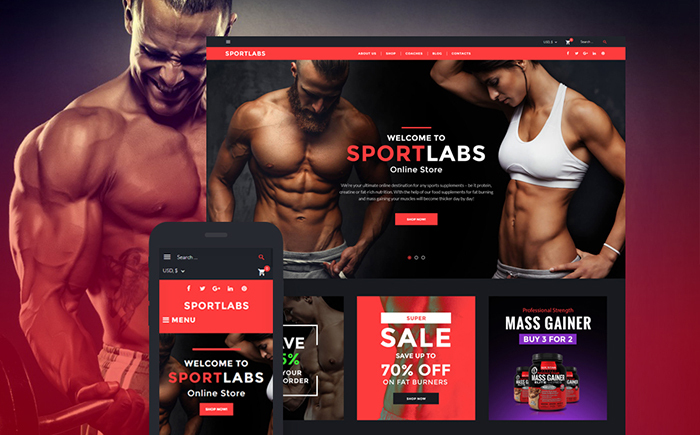 This powerful theme will satisfy those who want to create an online store that sells products connected with sports, either sports equipment or sports nutrition. With multiple layout options and various content modules you are able to add posts of different formats and arrange them the way you like. Additionally, you can use product carousel and sliders to save the space on your page and add any sidebars to your page. Moreover, the theme is equipped with Appointment Manager and Timetable Plugin, so you can also run a fitness club and let your clients will see your timetable and book classes online quickly. 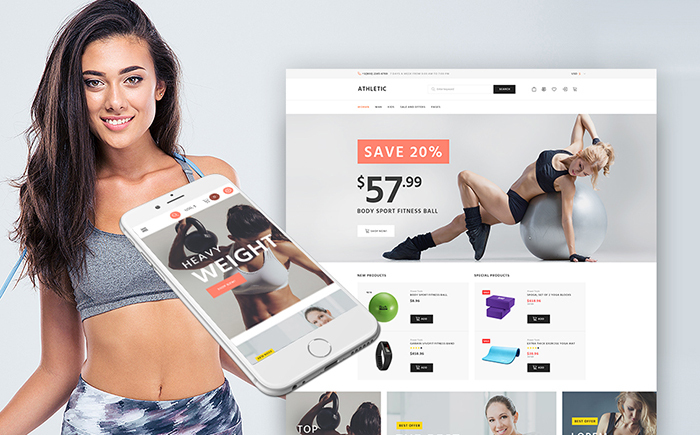 This theme will also be suitable for creating an online store connected with selling sports equipment or nutrition. Including numerous Cherry plugins, the template will let you present different information and enhance your site’s functionality. Wishlist and Compare options will surely become an attractive feature for your clients, as these options provide people with the possibility to think carefully and choose the most appropriate item. You can also enchant your visitors by the WooCommerce quick view that displays necessary information about a product in full size when needed. 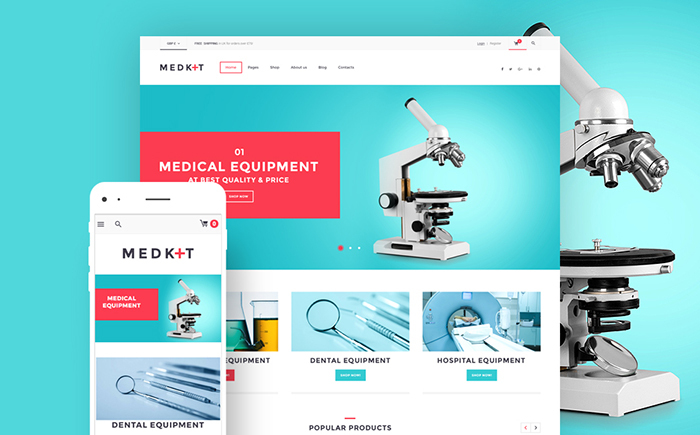 Designed for creating an online store that deals with medical equipment, this theme will let you organize your goods into numerous logical categories using product tabs. Your customers will be fascinated by the sorting options that will let them filter search results according to different criteria and find the items they need. With Live Customizer, you will be able to edit your store easily and effectively, as you will see the changes that you make to your page without reloading the website. 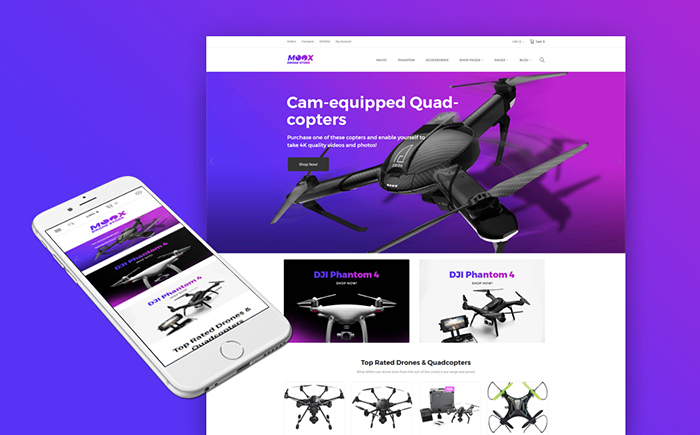 If you want to run an online store that sells drones, this intuitive theme will be your perfect choice. It includes various layout options to make your site unique and it allows you to add posts of different types due to content modules. Furthermore, there is a WooCommerce Quick View that lets visitors find out all necessary information in a really fast way. The theme also includes Wishlist and Compare options that allow your visitors to add different goods to the list of desired items and compare their properties. 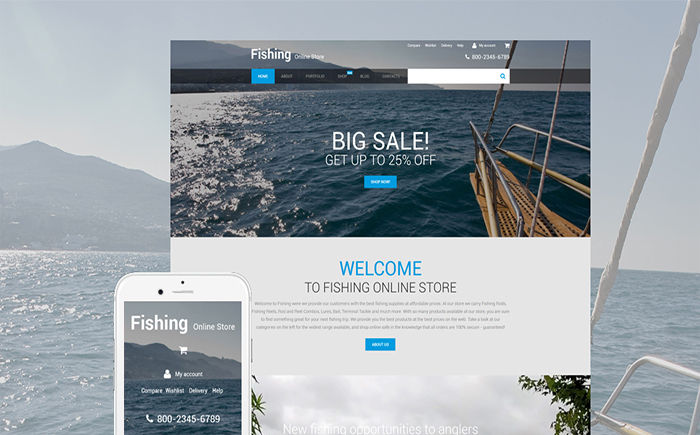 This effective theme appropriate for a fishing online store will amaze your visitors not only with Parallax effect, which gives the sense of full immersion into the site, but also with Lazy Load effect, which will make the page load faster. Also, Stick-to-top menu improves customers’ navigation, because they do not have to scroll the page when they need to come back to the top. Moreover, the functionality of the site is enhanced by the Product Zoom that lets your visitors enlarge items and scrutinize any details and by the Quick View button that allows people to find out properties of the goods instantly. In case you need a template to create an online store that sells bikes, this one can become a nice choice for you. With WooCommerce Package that contains advanced banner grid management, products carousel, categories widgets and on-page custom menus you will be able to showcase your goods in a number of ways. Multiple layout options will let you arrange your webpage the way you find most appropriate, while Content Modules will allow you to add posts of different types and formats. Additionally, Quick View, Wishlist and Compare plugins will attract visitors, because they efficiently present detailed information and give people a chance to think over their choice. 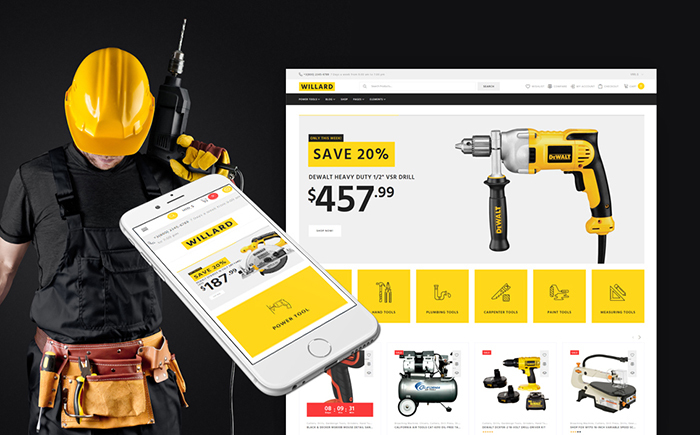 Designed for an online store that deals with tools and hardware, this theme is characterized by numerous options and plugins to improve your site’s functionality. It contains an ultimate pack of Cherry plugins, such as Cherry Projects, Services, Testimonials, and others, and an impressive WooCommerce package, including advanced banner management, product carousel, categories widget and many more, to improve the ways of presenting information on your website. Moreover, you can add a calendar, a commenting system, a newsletter popup, and other social options to promote your store. 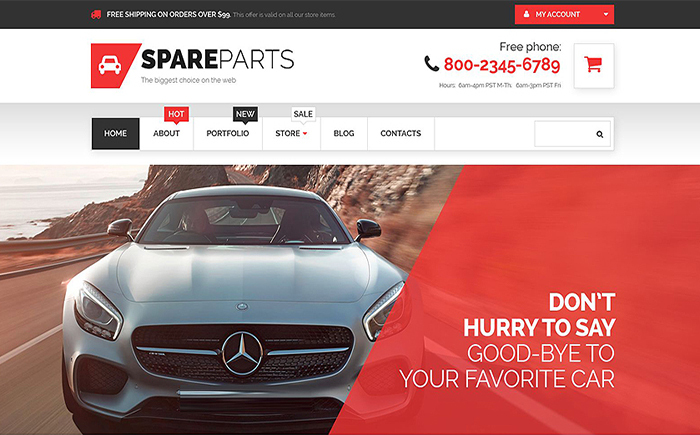 This fully editable theme for online stores dealing with car parts allows for different custom post types and formats. Furthermore, it includes fantastic sliders and custom widgets, multiple color options and Google fonts to make your page suit your needs and style. The theme is also multilingual ready, so your store can function in different languages. 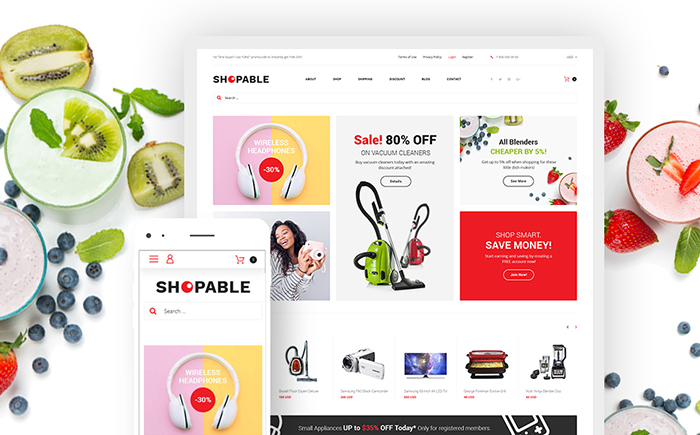 In case you have not found your perfect online store template, you can browse through other WooCommerce themes. To find out more about TemplateMonster, you are welcome to watch the video below.